Use TrueJob’s built-in job statistics and analytics to demonstrate to members how you helped them find quality candidates to grow and improve their businesses. This information helps you retain and recruit members. You can also charge separately for job postings to generate non-dues revenue. Your members can use TrueJob’s analytics dashboard reports to determine which job postings are most effective at attracting more, higher quality candidates. Smaller member companies without advanced recruiting tools can use TrueJob’s Applicant Tracking Module to manage the candidate evaluation and interview process. If you don’t already have a job board, implementing TrueJob will significantly increase your site traffic. During implementation, use TrueJob’s unique promotional campaign plan to ensure awareness of your job board. And, you can add applicant email addresses to your existing communication distribution list. Watch our video to see how you as a Trade or Professional Assocation can provide more value to your members, attract more sponsorships and funding, and increase the traffic to your website by adding a job board. This webinar, "Why a job board can be an essential part of your association's success", takes an in depth look at the key features association's should look for in job boards, includes a demonstration of a job board on an association website, and discusses benefits for your association. If you prefer, you can read a transcript. 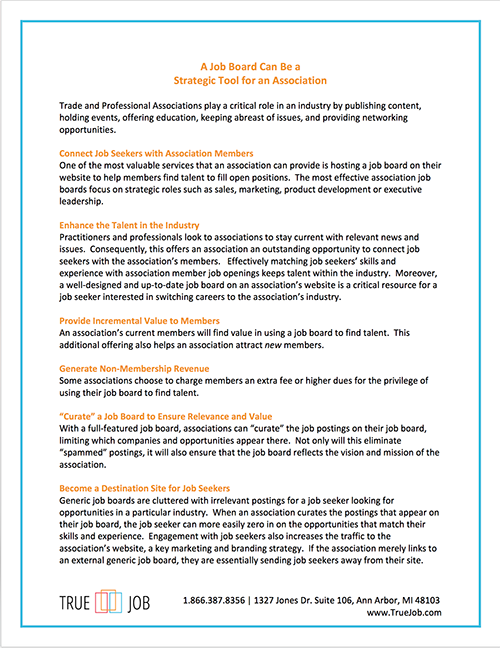 Read our concise overview of how a job board can be a strategic tool that translates into more members and revenue for your association. 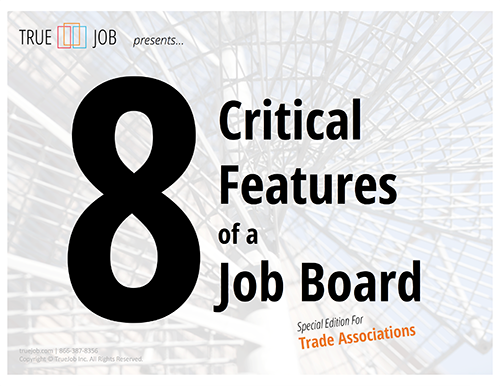 Considering a job board for your association’s website? Learn about the eight key requirements you need for success.